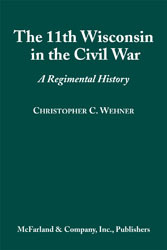 This volume details the Civil War experiences of the 11th Wisconsin Volunteers as they traveled more than 9000 miles in the service of their country. The book looks at the attitude prevalent in Wisconsin at the start of the war and discusses the background of the men who comprised the regiment, 72 percent of whom were farmers. Compiled primarily from the letters and diaries of the men who served in the 11th Wisconsin, the work focuses on the firsthand day-to-day experiences of the common soldier, including rations (or lack thereof), clothing, disease, and, at times, the simple act of waiting. The 11th Wisconsin lost more men to disease than to battle, so their story presents an accurate picture not only of the heroic but also the sometimes humdrum yet perilous existence of the soldier. Appendices provide a list of occupations practiced by the men, dates of muster into service for the regiment’s companies and a copy of a sermon delivered by George Wells after Lee’s surrender in 1865. Christopher C. Wehner is a history teacher in Colorado. “a first-rate account of a Union regiment that fought in some of the toughest campaigns of the Civil War in the West. Well researched and well written. Highly recommended”–William Shea, co-author of Pea Ridge and Vicksburg Is the Key. My Great Grandfather was a muscian in the 11th regiment, Wisconsin during the Civil War. His name was Horace N. Polley, he was in Company H and enlisted in 1861. Hoping to ger a copy of your book! Am also a high school history teacher. Am doing background research. Awesome hope you enjoyed it!